Update: As of 1 November, 2017, LOABeads MabBind A is called LOABeads PrtA30. LOABeads MabBind A are optimized for highly efficient purification of mAb’s from cell culture harvests, like hybridomas and CHO cell cultures. By substituting your chromatography columns with LOABeads MabBind A, you can simplify your purification process and save money. LOABeads MabBind A are ideal for use in magnetic bead affinity chromatography (MBAC), a substitute for downstream column chromatography. MBAC is great for lab-scale purification of antibodies to be used in, e.g., R&D, diagnostics, and characterizations of candidate biopharmaceutical IgG antibodies. The quantity of beads can be readily scaled up or down to match antibody concentration and sample volumes. 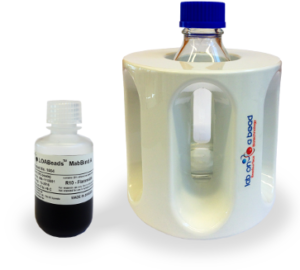 Small scale conditions provide the same yield and purity in 500 ml sample volumes with 900 mg IgG. Delivered in vials of 1 or 5 ml beads (in suspension), corresponding to 1 and 5 ml protein A agarose chromatography columns.